Dr. Omar Attum is a wildlife biologist and associate professor of biology in the School of Natural Sciences at IU Southeast. His primary interest is in the ecology and conservation of species ranging from sea turtles and dugongs to copper-bellied water snakes and the Nubian ibex. Attum collaborates with international organizations such as the Egyptian Environmental Affairs Agency, the Royal Society for the Conservation of Nature and many others in studying habitat use, migration routes, re-introduction techniques and other aspects of conservation biology. 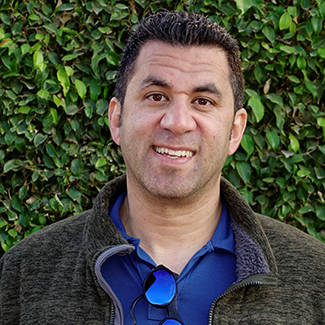 Among his many involvements, he serves on the scientific committee of the Saharan Conservation Fund and the editorial board of the Journal for Nature Conservation, and is a reviewer for numerous scientific journals. He has authored and co-authored research that has been published in scientific journals such as The Journal of Arid Environments, Biodiversity and Conservation and Mammalia. An avid photographer whose work has appeared in National Geographic, Outdoor Photographer and others, he is the author of the book, Sinai: Landscape and Nature in Egypt’s Wilderness (2014). He is currently working on a Fulbright fellowship in Wadi Rum, a celebrated yet vulnerable desert ecosystem in Jordan. Dr. Attum spoke with academic information officer, Steven Krolak. What attracted you to Wadi Rum? It is very easy to fall in love with Wadi Rum. Deserts are my favorite ecosystem and the deserts of Wadi Rum are among the most scenic and picturesque in the region. For a protected area, this is a very convenient and accessible study site. The staff are extremely friendly and hospitable and like collaboration. They do have staff accommodations, but they let me camp in the area with the oryx. It is special to be able to take night walks to look for snakes and wake up to oryx grazing. Wadi Rum is one of the more biologically rich areas in Jordan and broader region. The research opportunities in Wadi Rum are special and numerous. There is a population of reintroduced Arabian oryx, which provides so many opportunities to study issues related to wildlife re-introductions, which is one of my main research interests. There are also healthy populations of Nubian ibex and other rare species. The Wadi Rum staff and I view this as a long-term relationship that will continue after I return to IU Southeast in which we will collaborate on future research and possibly bring visiting IU Southeast students. Wadi Rum is a World Heritage Site, with petroglyphs and other evidence of ancient human habitation. What makes this area, a UNESCO World Heritage Site, so important for humanity, but also for your conservation work? Wadi Rum is an amazing place because not only is it biologically rich and visually breathtaking, but it also has some of the largest concentrations of rock art in the region. During my hikes and surveys, I often feel like I am walking through a living museum as I stop to read the rock art, inscriptions, and archaeological sites. 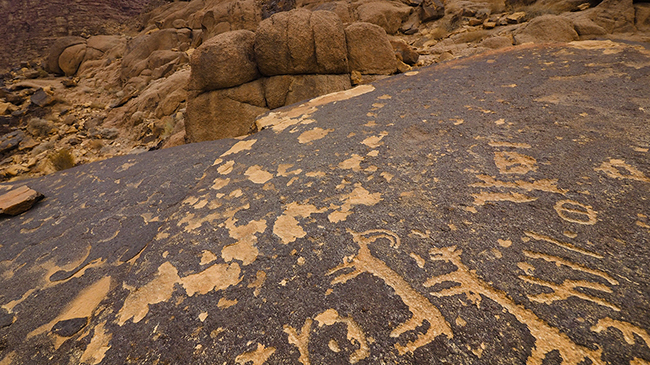 The conservation of large mammals, which are featured so much in Wadi Rum rock art, is part of that contemporary legacy. At the moment, the Middle East is constantly in the news, yet the natural side of the region is not well known. What makes it special? What people often don’t realize is that Jordan is remarkably safe and the people are hospitable and friendly. The Middle East that I live in is very different from the one on TV. I believe the combination and connection between the environment, archaeology, history, culture, and modern history is what makes this part of the world a remarkable area for research. My wildlife research occurs in areas with archaeological sites that date to before the common era (BCE). When I am in the field, I often wish I was a geologist, anthropologist, archaeologist, or historian. In fact, some of my future work in the region will involve cross-discipline collaborations to study the biological importance of archaeological and culturally significant sites. 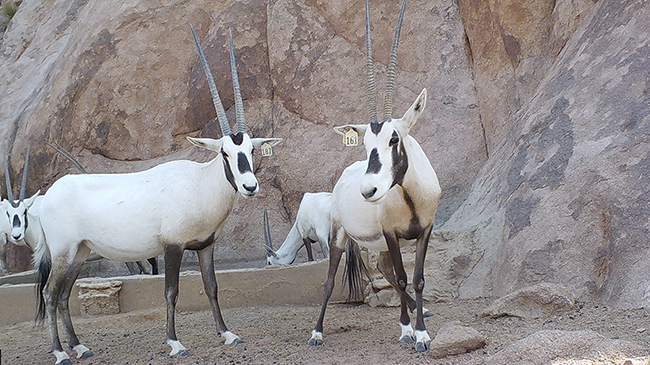 The Arabian oryx was hunted to extinction locally, and is now being reintroduced (since 2002). What is your role in the project? My role is more of a scientific adviser in which I work with the staff to analyze oryx population data and design new research to answer questions related to oryx ecology and management. We are estimating yearly survival and recruitment to model future population growth to determine the most effective long-term management strategies. In addition, we will soon begin starting yearly vegetation monitoring to determine the relationship between vegetation cover and population growth. The reintroduction of the Arabian oryx is the focus of Attum’s research. Why is it important to reintroduce this species, from a cultural and an ecological standpoint? The Arabian oryx is the largest native mammal in Jordan, which has all sorts of implications. The Arabian oryx probably regulates the vegetation community to some extent, while the calves are predated by Arabian wolves, and dead oryx are eaten by scavengers like vultures. The conservation of the Arabian oryx is a litmus test. If the Arabian oryx can be conserved, then the future for other species in the region is hopeful. What are the main challenges to its reintroduction and survival? The main challenge to the conservation of the Arabian oryx are human related: space and hunting. Oryx need large amounts of space because they traditionally moved long distances from vegetation patch to vegetation patch after recent rains. The oryx are safe in a section of the reserve that is fenced off, but eventually the fences will need to come down for the population to grow. Inside the reserve, there are normal, high rates of Arabian wolf predation on calves, who are too small and slow to defend themselves. If a calf can survive the first three months, then it will likely live a long time. The population will continue to be healthily as long as the adults live a long life in order for them to reproduce many times. With a documented 12,000-year history of human habitation, Wadi Rum is an exceptional cultural area. Why is it important to conserve its cultural resources? How does your work contribute to a richer learning experience for your students? I like to bring my research into the classroom to use as examples to illustrate concepts learned in lecture. For example, I try to have students analyze a component of the data during labs to reinforce concepts we have discussed in class. This allows students to see the applications of the concepts and ask specific questions that they might not ask in a typical classroom situation. When students visit Jordan as part of field biology, they often get to participate in the research, visit the field sites and see the species. The visits bring everything together. Photographs courtesy of Omar Attum.